In the prior scene, Puyi is released from prison and granted citizenship in the Peoples Republic of China. The next scene cuts to Puyi working in the garden, and in the screenshot I selected, we see Puyi walking in the garden. The garden itself is lush, green and full of life, which is contrasted by Puyi’s all grey Mao Suit. I interpreted this scene as the garden represented Puyi’s inner self that isn’t represented by his costume. Puyi finally feels tranquil and at peace, as seen in the tranquility of the garden. This is paralleled by the outward representation of lack of color in Puyi’s costume. Although the filmmakers wanted to contrast Puyi’s costume with his surroundings, in this screenshot Puyi almost appears apart of the background. The filmmakers wanted to emphasize that Puyi’s true internal identity is not represented by his many different costumes, but instead comes from him being at peace with his external surroundings. The Mao Suit that Puyi wears in this scene is grey and also lacks the armband and book that is seen with the Red Guards of the following scene. In Mao’s China, the traditional Mao Suit was either grey or blue. The filmmakers chose to use a grey suit to further disconnect Puyi from a class hierarchy. By choosing grey over blue, the filmmakers also further emphasize the plainness and lack of color displayed by the suit. The filmmakers choice to dress Puyi in a colorless, plain Mao suit was in effort to strip any sort of identification recognizable from an external viewpoint. This furthers the message of internal identity as opposed to a costume determining Puyi’s identity for him. The Mao Suit that Puyi wears is also restrictive when compared to the flowing nature of the Imperial robes he wore when he was a child Emperor. The restrictive nature of the Mao Suit is a symbol of the lack of control Puyi now has over external instances. However, the flowing robes Puyi wore as a child allowed for movement demonstrating the free-flowing ability ??? the child had over his surroundings. Puyi’s inability to control the issues around him, as represented by the Mao suit, further demonstrate the focus on internal understanding of identity. The all grey, formfitting Mao Suit worn by Puyi in this scene struggles to show any political, economic or social denotations. However, it is only in these final scenes where Puyi is able to feel at peace with his own identity. This shows that the filmmakers wanted to emphasize that true identity comes from within. This could also be seen as a Western criticism of both Imperial and Communist China, seeing as the Puyi only found peace when he wasn’t affiliated with either of them. This entry was posted in The Cinematic - Fashion in Film on May 4, 2016 by slemkin. This is an advertisement for Estee Lauder’s whitening cream that was released in China. 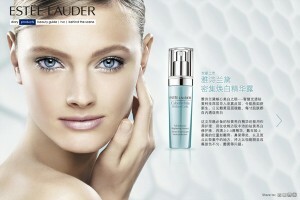 Estee Lauder is an American beauty product manufacturer that just recently released products and ad’s in China. Although this product is aimed at a Chinese audience, the model used is white. This is problematic because while both Chinese and American companies are starting to globalize, the white model is still the standard of beauty. This is being further perpetuated by Western media’s influence on Chinese advertisements. The first thing I noticed in this advertisement is the use of a white model. Not only is she white, she also has blonde hair and blue eyes. These features are stereotypical of ideal white beauty standards. By using a blonde hair, blue eyed, white model in china, Estee Lauder is trying to show that if Chinese women use their product they will be closer to attaining this white standard of beauty. However, the product is trying to sell a moisturizer that whitens the skin tone. The product itself is called “Cyberwhite.” This lightening of the skin tone is a Chinese beauty standard, not an American one. Estee Lauder is still trying to profit from the Chinese market, while continuing to keep an American beauty standard. American beauty product and Chinese market : issues raised? In both advertisements, the model hand is in a very similar position. Her left hand is placed on the side of her face near her chin, while her fingers rest behind or on her ear. By having the model, place her hand on the side of her face, she is framing her face and drawing more attention to her face. She invites the consumer to look at her and she appears to be looking back. This model-consumer connection makes the model appear more human and more attainable. This encourages the sale of the product. Even though both models have blue eyes, blonde hair and impeccable bone structure, they also appear human. They are not completely unattainable, so if you buy this product you can attain this standard of beauty as well! These advertisements also display both Chinese and English writing, (important and explain) this demonstrates the globalization of the beauty market. 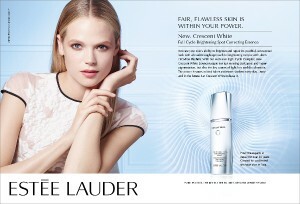 Although there is a hybridity of Chinese and American cultures on these advertisements, Estee Lauder’s choice to use a blue-eye, blonde-haired white model proves that the Western beauty standard is still dominant and influential transnationally. This entry was posted in The Commercial - Wedding Gown & Beauty Economy on April 13, 2016 by slemkin. This photo is a screenshot from the 1960’s American film, “The World of Suzie Wong.” This film tells the story of an American artist, Robert, and a Chinese prostitute, Suzie, who fall in love. The photo above features Suzie in Robert’s bed, posing for him as he paints her. This movie envelopes and further perpetuates the stereotype of a hyper-sexualized Chinese woman who needs to be saved by a Western man. In the 1960’s the qipao shifted from a Chinese symbol of national pride into an article of clothing that enveloped Western stereotypes of Chinese sexuality and femininity. In this photo Suzie is dressed and positioned to invite a Western male gaze. She is being filmed from the perspective of a Western male who is painting her. This invites the audience, who is primarily a Western audience, to also observe her and prescribe our own interpretation of who she is onto her. Her body is turned to the audience and she is positioned in a way that exposes her womanly shape, furthering the invitation to stare, fantasize and orientalize Suzie. This photo exemplifies how in the 1960’s the qiapo began to be viewed in a Western world. This photo invites Westerners to gaze upon Suzie as an Oriental woman, and it also invites Westerners to prescribe sexual stereotypes unto the Oriental women. good point which needs explanation of how qipao generates invitation of gaze? This film also focuses on the femininity of Asian woman. Although Suzie is portrayed as hyper-sexualized, she is also feminized. Suzie is portrayed as weak and as needing the intervention of an American men and this can be seen in the photo. The qipao is lavender colored, a color that represents subdued femininity. Although she is positioned in a sexual manner on a bed, she also covers some of herself with her arm. This shows that although she is a sexual being, there is also an aspect of innocence here. Her face appears worried or scared invoking feelings of her helplessness. As an audience we are meant to pity her, and therefore want her to be saved from this life absent of Western morals. This photo symbolizes the Western view of a sexualized and feminized Chinese woman and it connects these stereotypes with the qipao. In the 1960’s the qipao began to become popular in Western culture. However, in China the qipao declined in popularity in 1960’s. This demonstrates how Western perspective can take aspects of other cultures and use them to develop false notions of these cultures. This entry was posted in The Modern - Qipao on March 2, 2016 by slemkin. This photo was taken by a professional photographer and is of a Chinese family. In this photo the girls and boys are clearly separated, which expresses the divide of power among men and women in the home. The man, presumably the husband, has his arm at rest and is staring directly into the camera. The sons are also staring straight into the camera, while the wife and daughter are staring off into the distance. This demonstrates that a woman is valued by her subtlety and reservedness. Foot binding was a tradition that was passed on from mother to daughter, (topical claim) so although it was practiced throughout China, it was also a personal and familial matter. In this photo the mother and daughter are seated next to each other and are both dressed and and positioned almost exactly the same way. This portrays how mother and daughter relationships advanced traditions. The women’s feet are predominantly concealed, with just the tip of the lotus shoe revealed, demonstrating the idea of beauty in concealment. The woman are sitting up straight while the men are allowed to slouch. The women’s clothing is silk, ornate and well preserved. Their hair is well kept and decorated. The women in this photo appear well-mannered, civilized, polished and decorated, while the men seem more relaxed, they are less decorated and there feet are not bound. Although bound feet did emphasize the importance of a delicate and submissive women, it also put the power of conserving Chinese civility in the hands (or feet!) of the women, clearly demonstrated by this family portrait. In the family, foot binding was just as complicated and multi faceted as it was in all of China. It separated the women from the men and it continued through mother-daughter relationships. 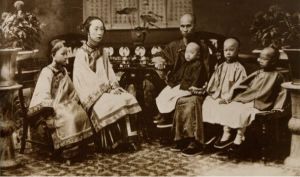 While one could argue that this practice kept Chinese women weak and dependent, foot binding also put the emphasis of maintaining Chinese civility on the women of the home. This entry was posted in Fashion and Gender in China on February 15, 2016 by slemkin.